Ad Majorem dei Gloriam! : My Favorite Pinoy Adobo! Guyz out there! 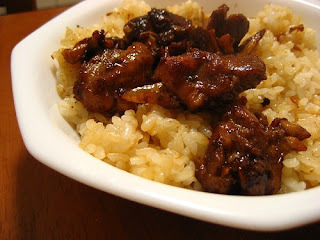 The filipino adobo is one great food here in the Philippines, it is serve in many occasions.. I really like the food,I can eat a whole chicken when cooked by this.. Try it to know whats the difference!.. Here's the recipe guide...It takes long minutes to finished cooking, but I tell you it's worth it. In a big sauce pan or wok, sauté garlic and onions on cooking hot 2 tablespoons of oil. Add the pork or chicken to the pan. Add 2 cups of water, 1/4 cup of soy sauce, vinegar, paprika and the bay leaves. Bring to a boil. Cover and simmer for 30 minutes or when meat is tender. Remove the pork or chicken from the sauce pan and on another pan, heat cooking oil and brown the pork and chicken for a few minutes. Mix the browned pork or chicken back to the sauce and add cornstarch dissolved in water to thicken. Bring to a boil then simmer for an additional 5 minutes. Serve hot with the adobo gravy and plain rice. You have the option to add crushed ginger to the onions and garlic when sautéing. Ginger adds a unique flavor to your pork/chicken adobo.